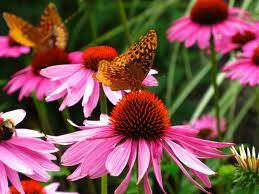 Coneflowers are bright perennials, some of which are used in herbal remedies. These flowers are easy to care for, relatively drought-tolerant, and are good for cut flowers. Coneflowers are daisy-like with raised centers. The seeds found in the dried flower head also attract songbirds to your garden. Loosen the soil in your garden using a garden fork or tiller to 12 to 15 inches deep, then mix in a 2– to 4–inch layer of compost. Plant the seeds in the spring in humus-rich, well-drained soil about 1 to 3 feet apart, depending on the type, in full sun. Coneflowers can tolerate some shade. If you are moving a potted plant outside from inside, dig a hole about twice the pot's diameter and carefully place the plant in the soil. Bury the plant to the top of the root ball, but make sure the root ball is level with the soil surface. Water it thoroughly. In the spring, put a thin layer of compost around the plants, then a 2–inch layer of mulch to help keep the plants moist and prevent weeds. If you receive less than an inch of rain a week, water your plants regularly during the summer. If your plants are floppy, cut them to the ground after they flower. Remember to cut off the dead/faded flowers to prolong to blooming season and prevent excessive self-seeding. To attract birds, keep the late-season flowers on the plants to mature. Divide your plants into clumps every 3 to 4 years in spring or autumn, although coneflowers do not like excessive disturbance. Plant your coneflowers as a border along a walk way or as part of your perennial cutting garden. Cornflowers enjoy full sun and well drained soil. The plants grow quickly up to 20 inches tall and 24 inches wide. Water your coneflowers often during the first growing season so the roots can become established. Mature coneflowers are drought resistant, but still need a weekly dose of water to survive. If the air is particularly dry, you may need to water your coneflowers more often. Deadhead the coneflowers during the spring and early summer to encourage new growth in the middle to late summer. Cut off the spent blooms with garden shears as the petals begin to brown. You can also cut out any dead or browning leaves to allow for fresh greenery later in the season. Do not deadhead the coneflowers in the fall, as the seed heads provide food for migrating birds. Shear your cornflowers back to about one-third of their growth during the early summer and you'll have thicker growth later in the season. Shearing a plant means to cut and remove most of the greenery and all of the spent blooms and stems. Divide fully grown and lush coneflowers in the spring or early fall, after the blooms have finished. Remove the plant from the ground completely with a shovel. Place the tip of your shovel at the top of the dirt and between the center leaves of your coneflower plant. Push down sharply with the shovel to cut the plant in half. Replant one half back into the hole where it was removed, and replant the other half in a new location. 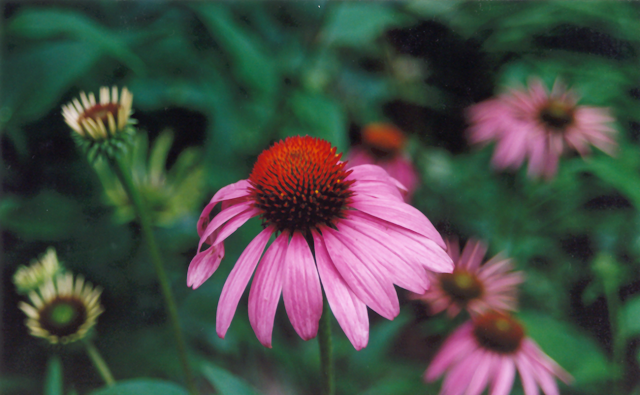 Water both halves of your coneflower after dividing and transplanting.